In a fast-paced game which saw some dogged defending by both packs, an almost certain Hoppers victory turned into a disappointing defeat at Lockwood Park. From the kick-off Hoppers looked lively, shrugging off the sluggish start to their last away match with early penetrating runs by Altham and Scott making good ground. Huddersfield responded and after several kicking exchanges, were rewarded with a penalty in front of the Preston posts quickly taken by Will Milner. The home side then kept up the pressure and only a try-saving tackle from Conor Trueman prevented them from extending their lead straight away. However, another penalty in front of the posts gave Huddersfield a six-point lead from the boot of Milner. Hoppers’ forwards then created a series of attacks, pinning down the opposition inside their own 22-metre line, winning scrums and moving through the phases as they constantly pressurised the Huddersfield try line. This proved too much for the home side’s Bradley, who was yellow-carded for foul play. From the penalty scrum five metres out, Matt Lamprey crossed the line in the corner. From the re-start a penalty on the 10-metre line was converted by Tom Davidson to put Hoppers ahead 6-8. Spurred on by this the backs launched a scything attack with a ‘Cipriani-esque’ long pass from Davidson taken at speed by Tyler Spence on the wing to score a superb try, which Davidson then converted. With their sin-bin period over, Huddersfield then defended their way to the end of the half and the teams went in with the score at 6-15. The second half started with a blistering run from Hoppers’ Jordan passing to Trueman and leading to a line-out on the Huddersfield five-metre line and Alastair Murray bursting over the line to score in the second minute of the half. Davidson converted and the score was 22-6. Huddersfield regrouped and from a series of re-set scrums Joseph Green crossed the line and the conversion by Milner was good. 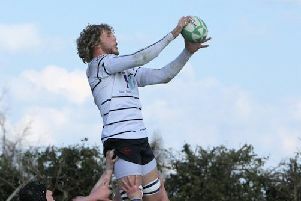 Hoppers responded quickly and from the re-start a penalty enabled James Fitzpatrick to score the bonus point try. With the score at 27-11 and 10 minutes to go, Hoppers seemed home and dry only to have a series of errors allow the home side to score three tries in the dying minutes. Coach Paul Arnold said: “We played some good stuff against a very good Huddersfield side.